How to Use An Orbital Sander? For any DIY-er, there is nothing more satisfying than having a project with smooth edges and surfaces. Thankfully, an orbital sander offers you a chance to attain perfection in your projects. An orbital sander is a versatile tool that helps craftsman in making a variety of projects with great finesse. It can be used in woodworking, metal-working, plastic-working and more. If you have struggled enough with belt sanders, disc sanders, random orbital sanders and more, orbital sander would be certainly a great relief for your creative mind. The machine came in the market decades ago and it certainly has gained the most-popular homeowner tool title over the years. Now, most of us would already have an orbital sander, if not, you are certainly considering buying one as you are reading this post. But, the first thing that must be addressed here is how many of us know how to use an orbital sander? We are sure not many. Although it isn’t a complicated tool to use considering the effects it can add to your projects, it is a must to know the critical rules of handling this machine with expertise. Let us start with understanding the orbital sanders first. An orbital sander is a high-technology gadget that has changed the way we sand metals, wood or plastic. Also known as finishing sanders this tool is used for small stock removal from the wood pieces in the final (finishing) stage or production. This tool is very easy to control with one hand, thanks to its lightweight and smooth functioning. The square sheet that comes in contact with the wood, moves in small circular motions removing extra load from the surface. Orbital sanders have been so far claimed as the easiest to use & maintain tool. They do come in varieties and are categorized on the basis of their sheet’s size. Let us discuss each type of sanders in detail. When you need to finish wooden surfaces and the work is in a confined space, you need a ¼ sheet sander. These are compact and thus reach limited areas easily. This is the reason they are also known as ‘Palm Sanders’ as they are small and can be handled with one hand. When worn off, the sanding sheet of this tool can be replaced. For palm sanders, you will need 140 x115 mm size replacement sheet. These are the most commonly used sanders. Usually, fit to do any type of sanding job, these tools are popular in domestic as well as commercial setups. They are fairly small and can be easily handled while sanding. You will need a 93 x 230 mm replacement sheet to use with this tool. As the name suggests, these are the largest sanders in size. They aren’t very useful at homes but are more often used in commercial setups, where large sheets need to be sanded in minimum time. Bigger pad size means a bigger surface is sanded in less time. The replacement sheet size for this type of sanders is 115x 280 mm. The first one is profile sander or contour sander. This type of sanders come in different shapes and sizes and is designed for sanding intricately shaped surfaces like moldings and carvings. The second one is detailed sander and has a triangle shaped pad. This allows the sander to reach corners and restricted areas with ease. Orbital sanders are quite popular because of their smoothing capabilities. They are usually used to ultra-smooth wood, rounding sharp edges, sanding off the wood putty or varnish coats. It has a sanding sheet at its bottom, held by two spring-loaded clamps over a square pad or hoop and loop system. As the machine starts the pad vibrates and moves in small circles, better known as orbits. Once you have picked your type of tool, you could use it considering some do’s and don’ts. Here are some important things that ensure you make the best use of your orbital sander. Power sanders are operated through two buttons, one that allows you cut and resume power supply to the machine and second one – lock in button that allows for locking the power button in on position, letting you place your hand more comfortably on the tool. Here you must note that you should switch on and off the sanders away from the surface to prevent any damage. Now that the machine is ready, you may put it in contact with the surface and hold it with from the knob in a way that you do not exert any extra pressure on the machine. Any excessive pressure can make the surface uneven as the sander will end up sanding more than required. Usually, orbital sanders have a ventilation hole and you must not cover this hole while using the tool to avoid overheating. Some of the models have set of holes in a sanding pad as well that allow for sanding dust collection. 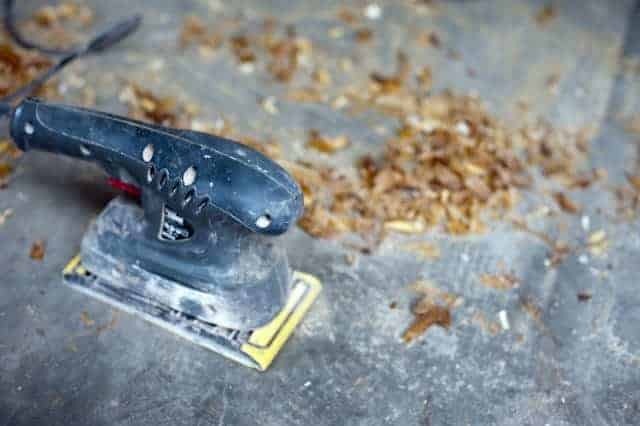 To get the best results out of your sanding exercise, you must move the sander backward and forward at constant speed and maintain the pressure and balance. However, you must be aware that if you have a new sheet of sandpaper in the machine the tool will be more aggressive than to a tool with used sandpaper, hence you must watch of your speed and pressure. Secure your work with clamps against the wood. Use the tool as directed in the manual. Do not let the machine running and unattended. Wear personal protective equipment for safety. Keep your hands at a safe distance.